Qualitank is a global supplier of quality used ISO tank containers for chemicals, powders and gases. At Qualitank we pride ourselves on keeping our ISO container tanks in the best possible condition. Our success is beyond doubt: over 500 units per year are being put into use as storage tanks all over the world and, while there is a limit to the number of uses to which a used tank-container can be put, it has yet to be reached. Qualitank only sells container tanks in excellent condition ready to be used for your business or company. If a leasing company, for example, insists that it’s redundant equipment is not re-used for shipping, we make every effort to ensure that their wishes are met, even to removing data plates and logos from the tanks. We rarely broker other peoples’ equipment preferring to buy the tanks ourselves before offering them for hire or resale. We buy because we believe we can sell, and this gives the customer confidence, knowing that his equipment has come from a single, reliable source. We keep our tanks in the best possible condition and can also perform after-sales services, recalibrations, and repairs to customer’s ISO tanks. A variety of modifications and customisation can be achieved on your ISO container tank, including rebranding and logos. We only offer tanks in the best condition after rigorous testing by our experienced engineers. 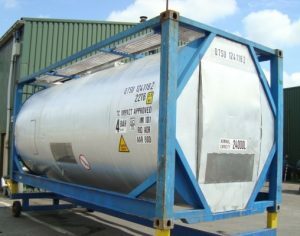 Qualitank have 40 years’ experience with the majority of types of Tank Containers. Our speciality is understanding the customer’s requirements and supplying as many/few tanks as may be needed. We are very happy to answer your enquiries to see if we can supply tanks according to your needs. Phone us on +44 (0)151 495 1116 or email info@qualitank.co.uk, and we will be delighted to see if we are able to help with your requirements.